I love searching for vintage furniture online. But our house is getting full, so let me help you fill yours with some finds. Circa 1962, these seats have been recently reupholstered in original Knoll fabric. 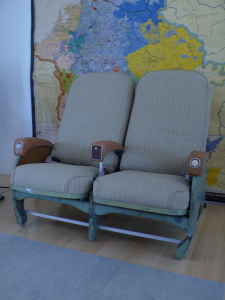 Seats recline, have the original ashtray, seat belts and magazine storage in back. Could be perfect for a travel-themed nursery.